'Den Of Thieves' Offers An Epic Cops And Robbers Tale, Re-'Heat'ed Christian Gudegast's film about a bank heist in L.A. borrows so freely from Michael Mann's 1995 film Heat it never quite recovers from the deep cinematic debt. 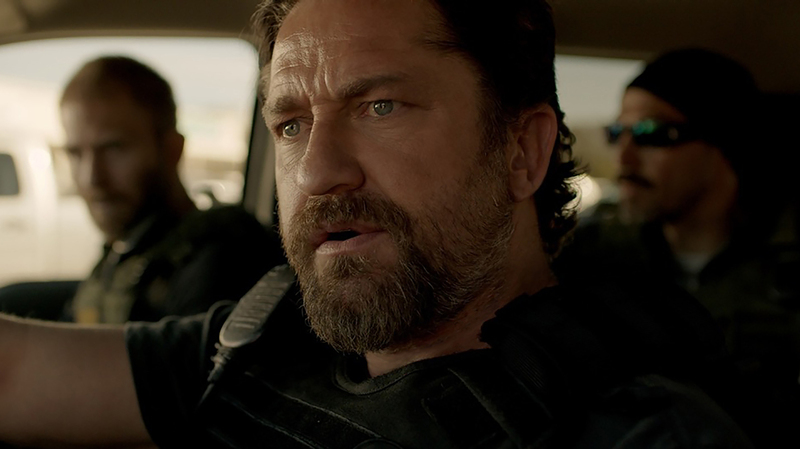 Gerard Butler stars in Den of Thieves. There's something unfair about comparing any policier to Michael Mann's Heat, even if you dissent from the popular — and one hundred percent correct — notion that Heat is the best cops-and-robbers movie ever made. For one thing, Heat is more like a movie-plus-expansion pack, a remake of a film Mann had written and directed for network television some years earlier, upgraded with a lavish budget and an A-list cast. It was at least the third Mann project to draw inspiration from the life of Chuck Adamson, a retired Chicago police detective Mann had befriended and helped into a second career as a TV producer and screenwriter. (Heat also borrowed thematic material and even dialogue from Adamson's '80s NBC series Crime Story, on which Mann served as executive producer.) Mann would make other significant films afterward, but Heat is the document that feels most singularly like his life's work. If you happened to be born the day Heat was released, you're 22 years old now. So the statute of limitation on remaking it — as London Has Fallen screenwriter/rookie director Christian Gudegast has done, without actually saying so, in his otherwise-not-half-bad new Den of Thieves — has certainly expired. But in his wannabe epic about professional crooks who aspire to nothing less than the daylight burglary of the Los Angeles Branch of the Federal Reserve Bank, Gudegast doesn't sweat his own brazen larceny that much. In the first hour especially, he leans into his beat-by-beat, scene-by-scene, almost character-by-character debt to that other movie. Where Heat featured an unhinged, heavily ad-libbing Al Pacino as the flamboyant head of an elite Los Angeles Police Department unit with a flaming-crater personal life in pursuit of a cool, methodical ex-con burglar, DoT features a — for whatever this might be worth—never-better Gerard (Geostorm) Butler as the flamboyant head of an elite Los Angeles County Sheriff's Department unit, with a flaming-crater personal life in pursuit of ... you see where this is going. Anyway, the methodical ex-con he's after is played by Pablo Schreiber from Orange is the New Black and American Gods. If Schreiber won't make you forget DeNiro, he's still a magnetic presence, the most cerebral-looking of DoT's many, many beard-bros with swollen arms and neck tattoos. Among the other notable cast members are Curtis "50 Cent" Jackson as the family-man member of the heist crew. (Tom Sizemore held this position in Heat). There's a funny scene, original to this movie in fact, wherein he makes a point of introducing his daughter's prom date to his tatted-up, 'roided-out colleagues. O'Shea Jackson, Jr. — famous for having played his own father as a young man in Straight Outta Compton — is quite good as a bartender at a German brewhaus who moonlights as the gang's wheelman. (His day job earns him the nickname fraulein from Butler's character.) To the extent that Gudegast tries to do anything new within the canon of Cops and Criminals Are Two Sides of the Same Grimy Coin, it's when he sometimes tries to frame his sprawling tale through the eyes of Jackson's character, seemingly a beta forever abused by the alphas. But Gudegast deviates from this approach too frequently for it to lend the movie any sense of invention. Still, Jackson Jr. gets more screen time in DoT's more engrossing back half, when it opens up to borrow from more recent prestige coffee-table action flicks like Sicario, as well as from another highly-regarded 1995 crime thriller — no, not Heat, are you obsessed with that movie or something? — that I'd be spoiling things by naming. The particulars of the Federal Reserve job are worked out with a Soderberghian precision that feels at least vaguely plausible while you're watching the movie; it's something about the crooks stealing only "unfit" currency that the treasury was going to remove from circulation and destroy anyway. And if you can stomach another movie where two parties fire machine guns at one another while the death, injury, and general panic of the dozens of civilians trapped between them goes unobserved and unremarked, Gudegast has an exciting gun battle for you. Here and there, Gudegast feels the tug of art, trying — as Mann did — to make the whole thing feel like some grand opera. But the real tragedy is that a movie that wants so badly to earn a place among the great Los Angeles crime pictures—Double Indemnity, Chinatown, To Live and Die in L.A., Drive, Nightcrawler, that other one I named several times — was shot in Atlanta. When Edgar Wright realized he couldn't afford to film Baby Driver in Los Angeles like he'd planned, he rewrote the script to turn the Atlanta setting into a feature rather than a bug. But Gudegast & Co. do everything they can to make the East Coast look West. So much for honor among thieves.